We’ve been eagerly waiting for the December/January issue of Vogue Paris to drop (as our forums do every year), playing a guessing game as to who might be this year’s guest editor. After shocking us with Rihanna as guest editor last year, names like Gisele Bündchen were thrown around. 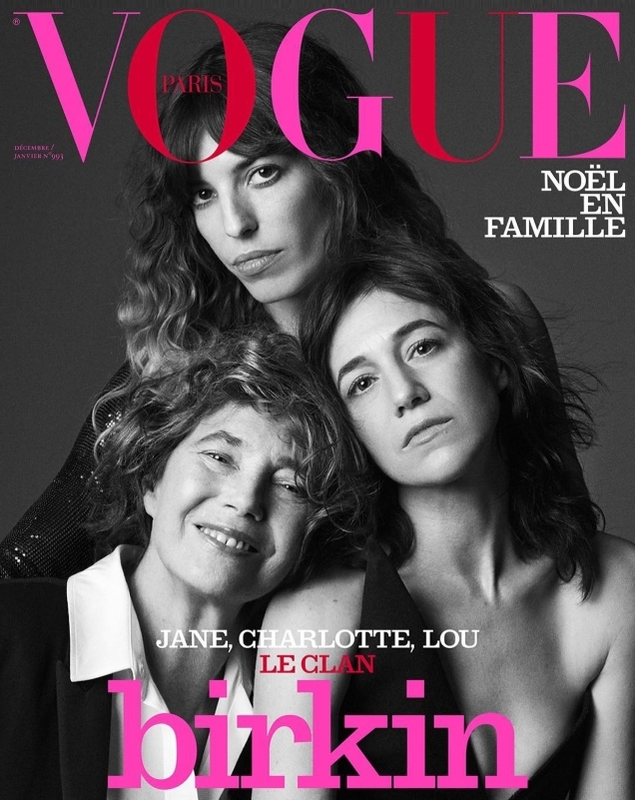 But Emmanuelle Alt has surprised us once again with none other than Jane Birkin, Charlotte Gainsbourg and Lou Doillon for 2018. The mother/daughter trio come together for “Christmas with the family” and pose for a classic black and white portrait shot, photographed by Lachlan Bailey (his very first VP cover) and styled by Alt in a mixture of Celine, Gucci and Saint Laurent. Unfortunately, the cover failed to get us in the festive spirit. “I’m so annoyed by the two-tone masthead, why does Alt keep doing this? It would have been perfectly fine if we got an all-red Vogue, festive without feeling juvenile. I’m also a little annoyed by how miserable Charlotte looks. All three are literally in a different mood and it shows,” dodencebt pointed out the moment the cover broke. “What’s with the clown cover design these days on Vogue Paris? And for all the use of bright colors, the lower lettering doesn’t stand out that well against the lines of the clothing behind it. There would be no shame in going for a more sophisticated look with metallic silver, complementing the cover shot, giving a nod to Christmas,” wrote tigerrouge. “If it’s a Christmas issue, it needed to be more festive and should not be in black and white,” TZ001 chimed in. “Such a boring cover to endure for two months,” a disenchanted Scotty added. Morgane07 wasn’t thrilled either. “Charlotte and Lou – especially Charlotte – look too sad for a Christmas issue. It doesn’t have to be festive but it’s a bit too grave for my liking, the opposite of uplifting,” she said. “Way to hide the beauty of three amazing powerful women,” EstefaniaAbaddon complained. “These year-end issues of Vogue Paris used to be so celebratory and vibrant. The past few years, c’est déprimant,” commented dfl-001. Await the contents of the issue and join the conversation here.